The walk-up process is pretty simple. then select an available bike from its dock. Before you ask, no, you cannot use your TAP card to pay for a walk-up ride. But you can link a bike share pass to your TAP card if you plan to use Metro Bike frequently, and then you can skip pretty much all of the above steps. You get 30 seconds to grab your chosen bicycle, and then you’re on your way. Pro-tip: the best speed setting for general riding around is probably second gear. The bike feels sort of wobbly on first gear unless you’re jamming uphill, and it’s a bit of a workout to pedal in third. The protected bike lane on Los Angeles Street. The Metro Bike station behind City Hall. Despite the fact that I was a bicycle commuter when I lived in Taiwan, I have never really been comfortable biking the streets of Los Angeles. For the sake of getting a more extensive bike share experience, however, I tried. Los Angeles Street is easily accessible from Union Station and has a lovely protected bike lane, so that’s the direction I headed in. And I have to say, the bollards made the ride feel really, really comfortable. In the sections where the bike lane was just a set of painted lines, I found myself almost obsessively trying to stay within the lane to the point where I wasn’t really paying attention to my surroundings — which made it particularly nerve-wracking when a truck zoomed by. The trip to the City Hall was a quick one, but because I was just testing out the system, I decided not to dock my bike there and rode back to Union Station. Dropping off the bike was quick and easy, and you get a text confirming the bike has been returned, which is nice. So, final verdict: am I a bike share convert? Will I be riding around DTLA every chance I get? Probably not every chance…I am personally well served by Metro, DASH and my feet, and I’m just not a confident enough bicyclist to routinely bike DTLA. But once the weather cools off a little more, I think I would try and use Metro Bike to swing by some of the places that normally take too long to walk to, like Poppy + Rose near the Fashion District (I really, really want to eat here ~ ). And of course, loving my two feet more than riding on two wheels doesn’t mean I don’t see the value of having a thriving bike share system. More bikes on the road make it safer to ride for all, and more mobility options make for better communities. I am looking forward to seeing the system expand — I feel like it will be much more useful to me in my neck of the woods (Pasadena). But until bike share gets there, I definitely encourage everyone to give DTLA bike share a try, especially as it’s only $1.75 per half hour ride through October 1. Here are a few streets with great bike lanes to help you get started. If bike share changes the way you get around and connect with transit, let me know! Metro’s BIF Business Advisors are here to help! I wish the Metro Bikeshare bikes had a few more gears, as I tended to pedal in third most of the time unless I was going up a hill. Yet if you go up a steep hill, first gear seems like a bit of an effort. Overall it’s a good start. Ok, I think that is pretty dumb we can’t use our regular tap card for a walk-up ride. Fix that. The reason is to prevent bike theft. Each bike check out must be linked to a credit card which may be charged if a bike is not returned and no report is filed. “Enter zip code” with what if the person using it comes from a country with no zip codes? Or a country with postal codes with letters them like Canada or the UK? Automatic fail to tourists from abroad, wouldn’t you say? You said you decided not to dock your bike at City Hall, but you COULD have, right? i wonder what happens when you go over 30 minutes? Absolutely could have, there were open docks! You can also use the bike share app to find stations with availability. If it goes past 30 min your credit card gets charged for the next increment of time, and I assume you get a text notifying you of this as well. And $1.75 per 1/2 hour seems pretty expensive. Compared to regular bike rental, $3.50 an hour is reasonable. At $3.50, it’s also the same as the cheapest, short distance Uber Pool or Lyft Line ride, probably even more expensive if doing split payments with a friend. Pay the same price for something slower and more sweaty and uncomfortable as a car. Why? The Santa Monica bike share prorates by the minute. For Metro bike share, if you go 64 minutes, you are charged the same as if you go 90. On the other hand, on bike share $1.75 will take you at least two, maybe three miles, even if you are one of the slowest bicyclists. 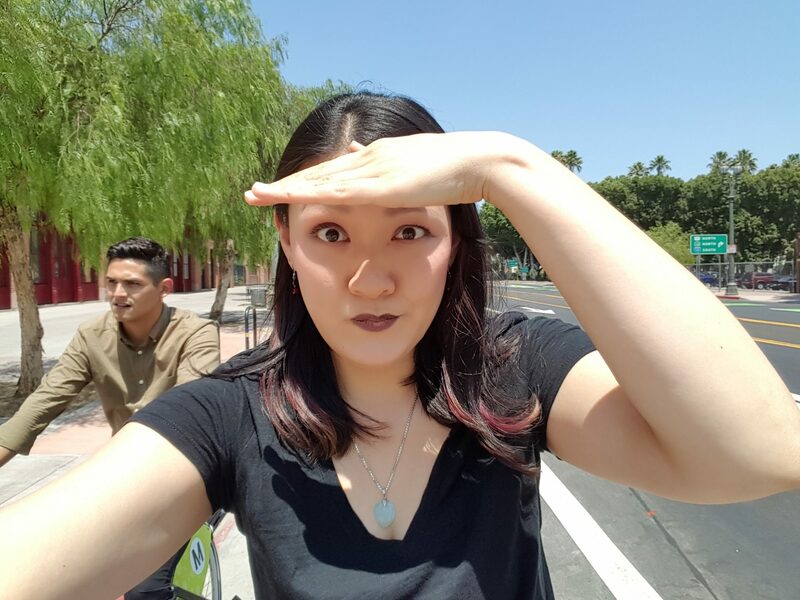 I am in the same boat as you Anna, it is nerve wrecking to ride a bike in downtown LA, but I still want to try the bikeshare for the sake of trying it out and support METRO’s effort in this new advancement. Do you foresee stations in the SF/SG Valley, Pasadena/Glendale/Burbank? Definitely worth trying! Walk-up is very convenient…a reason I still haven’t tried Breeze in Santa Monica is because of the app download requirement. Barrier level too high! Once more people are riding, it will probably feel more comfortable on the streets too. If you are being spontaneous and had not previously downloaded the app, what are the other options for figuring out where the other bike stations are, so you can determine if they are close enough to your destination? Do the bike stations have any map signage that show other bike stations, or do you have to do it all on the app or a website? Otherwise, what if you want to take a bike but either don’t have a phone, don’t have it charged, or can’t access wifi or 4G? That’s a good question and I’ll have to ask and see if maps will be added to kiosks. 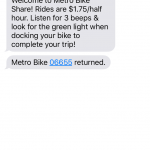 Or you can probably email support@bikeshare.metro.net directly. I wasn’t paying close attention but during my visit I didn’t see any. I would love to ride in downtown more often, but the lack of protected bike lanes makes biking on most streets around downtown too scary. Please add more lanes so we can have a thriving bike share system. If you are so worried about traffic go on a Sunday morning the streets are empty! Why is there no Metro Bike Share outside the Civic Center Metro Station? Placement of bike share stations is coordinated with local stakeholders.